Planked Boats: Planked boats signaled a revolutionary progress in shipbuilding as planking elevated ship design and construction into a more economical and scientific approach-one that offered improvements in ship size, dimension and linear shape. 画像2. 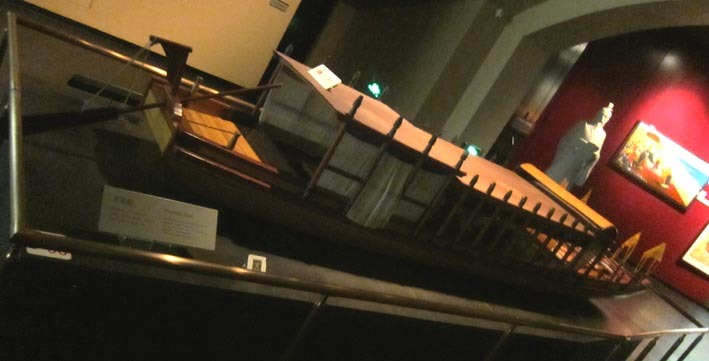 中山国一号墓木板船解剖的解析図(Structual model of the planked boat). ／plank: n.[海]厚板 [通例厚さ2～6インチ、幅9インチ以上]; 板[板でも、木製の板を指す]、板材 [西語] tablón、 vt.…に板を張る. ／planking: n.[造船][船体の]外板(がいばん)、船体外板、張板; 板張り [西語] tablazón.